Option 1 - Get a prepaid sim card with a cheap data-plan - EUR 6.9 for 7 days unlimited. Finland operator SAUNALAHTI offers a cheap prepaid sim-cards and cheap unlimited data-plan for them. You can buy a Saunalahti Prepaid package in any R-Kioski (there are a lot of ones all around Finland), top-up your balance a bit and activate a 7 days unlimited 3G data-plan for only EUR 6.9 or EUR 1.9 per day for the same unlimited traffic. 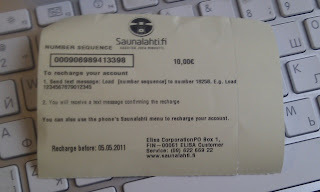 Saunalahti Prepaid package costs EIR 5.90 and comes with EUR 6.00 balance on board. But because data-plan costs a bit more, you'll need to buy also a top-up card. Minimum top-up card balance is 10 EUR and it can be purchased in the same R-Kioski. A EUR 10 Loading Card for Saunalahti. Most people in Finland speaks English well, so you should not have any troubles buying the needed in the R-Kioski. 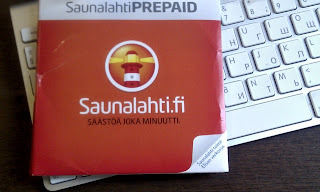 Buy a Saunalahti Prepaid package sim card and also one top-up (loading card) card for at least EUR 5 or more. 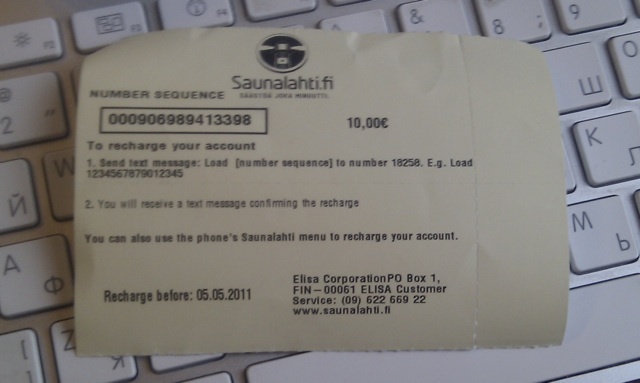 Ask cashier for a "Saunalahti Loading Card" - that's how they name the top-up cards. Top-up your account balance - for this, just send an sms with the text "Lataa XXXX" to the number 18258. Instead of XXXX put your top up card number - one in a black frame (see photo above). You'll shortly receive a message with a new balance results - should be EUR 6.00 + your card nominal in total. Now activate a 7 days unlimited data-plan by sending another sms with the text "DATA7" to the number 15020. You then should receive a message indicating amount of data-plan - EUR 6.90 as well as expiration date/time. The message is in Finnish but amount and expire time are recognizable. Now turn-on your phone 3G/EDGE access. APN names should be automatically received by phone from a sim card, but if not - just put it manually - the Internet APN is just "internet"
After the package expires, you can just activate a new one. Do not forget to top-up your balance if necessary before requesting a package as sending DATA7 message with insufficient balance may stuck operator system and you'll not be able to activate mobile internet until you remove/insert your sim card and reboot your phone. If you're traveling to Finland often, do not throw away the sim card after you leave the country - your account and mobile number is valid within one year after last balance top-up form a loading card. So next time you come back again - just insert your card and reuse it. To get a current account balance, just dial *100# and watch results on a phone screen. UPDATE: Next time you come to Finland or when your 7 day package expires, you may just insert your Saunalahti SIM and use it "as is", e.g. without the activation of new 7-day dataplan. In this case you'll get the same unlimited traffic for EUR 1.9 per day. This could be useful if you come to Finland for a day or two - in this case this will be cheaper than 7-day plan. Enjoy ! 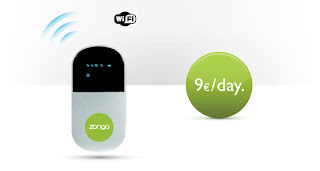 Option 2 - rent a mobile WiFi hotspot from Zonga - EUR 9.00 for 24 hr unlimited. A couple of months ago, a new startup appeared in Finland - a Zonga company. Zonga provides an unlimited mobile Internet access in a form of pocked WiFi hotspot you can rent in any Zonga service point and bring with you everywhere. While it is switched on - you can use any WiFi enabled devices such as mobile phone, iPad/iPod, notebook, etc to connect to the Internet. Actually, this device contains a permanently installed Finnish sim card inside and just retransmits the mobile 3G internet to WiFi devices, acting as small router. Device is rechargable, a battery lives from a single charge about 4-5 hours of constant use or about a day in a stand-by mode. A charger cord in included when you rent it. When you're done, just put the device into included envelope and drop-off to any post box all around Finland or take away back at any Zonga service point. The price of device rental is EUR 9.00 per 24 hour - this includes unlimited mobile internet data-plan. EUR 9.00 per 24 hour seems to be more expensive than Saunalahti EUR 6.9 per week, but if you do not want to dig with sim card buying/installations or want to share the Internet with several persons/devices at once - this could be a best solution. The one drawback is that Zonga does not have too many service points where you can rent the device. For example, if you're entering Finland by air via the Vantaa airport - you'll find the Zonga service desk right on an exit from arrivals hall of Terminal 2. But if you're traveling by car - there are no service points on those board crossing points and nearby, so prepaid sim-card option could be more convenient as you'll find R-Kioski even in almost any "lost in space" corner of Finland.